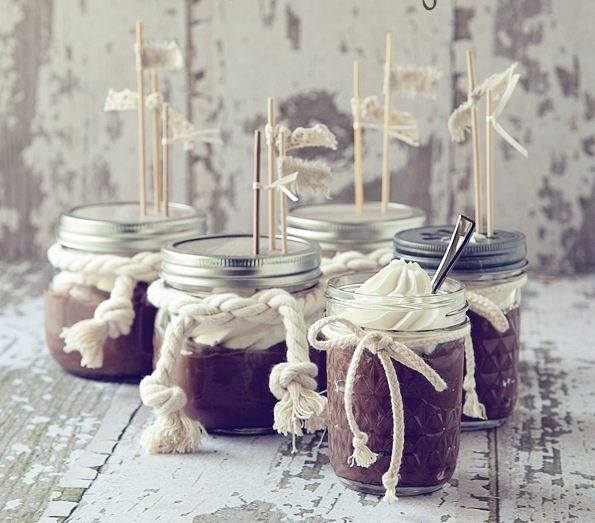 The little jars are a great idea for an upcoming party or gathering as your guests can simply pick them up and devour them at their leisure! They’re beautiful to look at and tasty to eat! Chocolate Eclair Cake – You can’t go wrong with this crowd pleasing dessert! With no baking required it couldn’t be easier to make…or tastier to eat! Red Velvet Cupcakes – Serving these cupcakes in jars means you can see the individual layers in all their glory! Top them with some beautiful sprinkles and they almost look too good to eat! 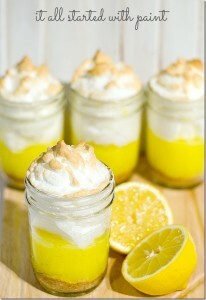 Lemon Meringue Pie – A Graham cracker crust, a zesty lemon pudding center and a sweet meringue topping? This is a dessert you’re going to want to try! The Best Banana Bread – Not only is this banana bread served in a jar, but it’s actually made in it too! Apple Crumble Cookie Dessert – Tasty baked sugar and cinnamon apples layered with a crunchy crumbled cookie and homemade whipped cream! 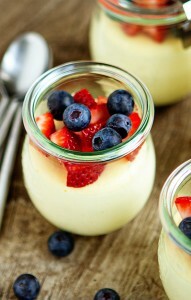 Vanilla & Honey Panna Cotta – Topped with poached gooseberries, this dessert is the perfect combination of sweet and tart! Serve them at a dinner party for a sophisticated end to the meal. Molten Orange Chocolate Lava Cake – Rich, gooey and totally delectable, this is every chocoholics dream! Eton Mess – Traditionally English, this mixture of fresh strawberries, sweet meringue and whipped cream is delicious! It’s quick and easy to make, bringing the flavor of summer to your table all year round. No-Bake Caramel Mud Pie – Even if you’ve only got a few minutes before your guests arrive, you can still make these simple caramel mud pies. Nobody will know that you weren’t slaving away in the kitchen all day! Key Lime Pie – Cool and creamy, these mini key lime pies are refreshingly zesty. Chocolate Pudding With Chantilly Cream – Grab a spoon and dig in! After your first taste of this delicious chocolate treat, you’ll never revert back to store bought pudding again! Salted Butterscotch Pots De Creme – With just a sprinkling of salt, you can transform this butterscotch pudding into a taste sensation! Elegant and oozing with flavor, what’s not to love? Peach Cobbler – Make a batch of these and watch them disappear! Maple Walnut Pie – Sweet maple syrup combined with spicy rum and crunchy walnuts make this dessert a winner! S’mores In A Jar – Bring the campfire favorites into your home with these delicious s’mores in a jar. Now you can enjoy them even when it’s cold outside thanks to this simple recipe. Taste The Rainbow Jell-O – Fun and vibrant, this rainbow jell-o dessert will bring some color to your table and some joy to your taste buds! Cherry Pie With Stars – Perfect for the fourth of July, these star spangled pies are not only delicious, but they’re easy to make too! Finished with a dusting of icing sugar, these cherry treats will be the star of any dessert tray! 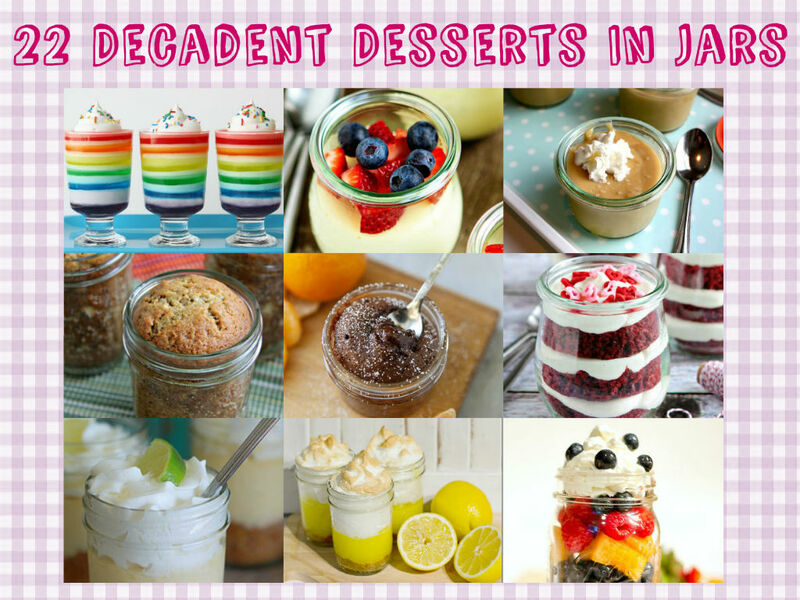 Cheesecake In A Jar – These cheesecakes are simple, portable, decadent and truly cute. Take one of these to work and you’ll be the envy of the lunchroom! Have them at a party and you’ll be the talk of the town! Banana Cream Pudding Parfaits – Bananas, pecans, whipped cream, wafers, toffee…need we say more? No Bake Mini Grasshopper Pies – For those of you that may not know, grasshopper pie is a light, refreshing dessert packed with a cooling mint and chocolate flavor. It’s fluffy, minty and totally yummy! Fruit Salad – Calling all fruit lovers…this dessert is one for you! The layers of fresh produce look so inviting in the jars and the best part is, you can use all of your favorite fruits and tailor it to your tastes. Mini Pumpkin Pies – Creamy, crunchy, spicy, sweet, it’s everything a good pumpkin pie should be!